For the crossover proposal “Living in smart cities” we are working towards the final round of submission due on May 21st 2019. This means that we can submit a complete application with a good chance in receiving funding. If successful, the program will start in January 2020. At the moment, the consortium already consists of 20+ Dutch companies and a large list of partners in academia and research institutes. We still need to expand the consortium and are looking for more partners. 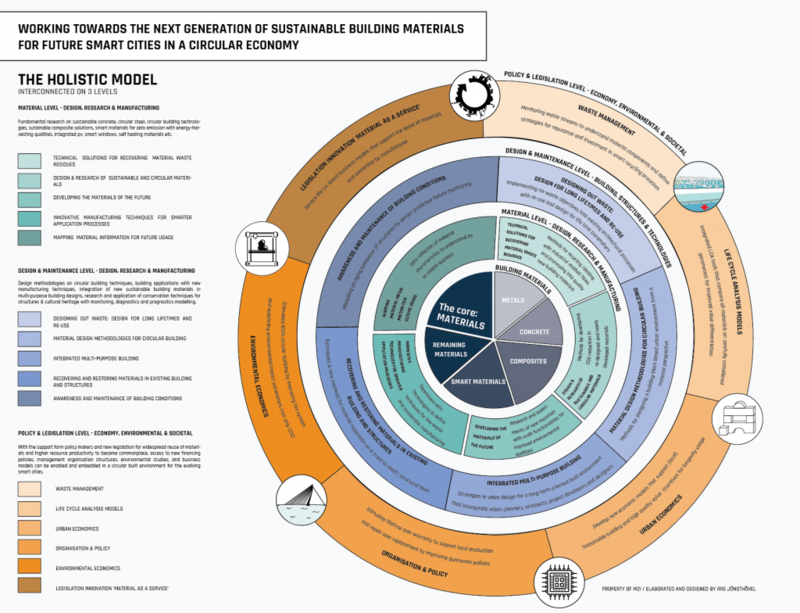 Topics can be related to research on sustainable materials and their applications, but we also need to focus more on the economic and social aspects of a circular economy; i.e. LCA’s, new business models, certification, smart logistics, big data, etc. The proposed program will contribute significantly to solving the societal challenges on climate, environment, resource efficiency and raw materials, and will be beneficial for businesses, society and the environment. The Netherlands has the opportunity to become world-leading in this combination of science areas. In order for the program to be effective, the development of science has to go hand in hand with new perspectives on investment policies, societal- and economical models for a circular smart city. Fig 1. The holistic model of cross-over disciplines gives an overview of the inter-connections on 3 collaborating levels in the development of a next generation of CO2 reduced sustainable building materials. It explains the necessity of working cross-linked in a circular economy. Around the core of materials, the three levels – the material level, the design & maintenance level, the policy & legislation level – include all the steps that need to be taken co-dependently and therefore cannot operate without each other. The focus will mainly be on materials used in the urban environment, specifically in the building/construction sector and in electronics areas in which The Netherlands plays a worldwide leading role. By developing new ways to better understand and predict degradation and damage propagation, we aim to prevent unnecessary or premature replacement and lay the foundations for new (healthy) designs and approaches towards longer lifetimes and less material waste.